The holidays are over; we have concluded three weeks of introspection, of asking for forgiveness from God and each other, of celebrating and building and dancing and eating and praying and so forth. Says what? A curious statement, indeed. The piyyut, the liturgical poem that features these lines in the siddur / prayerbook is incomplete; there is no direct object to the two verbs, mevasser (proclaims) and omer (says). Well, I’m going to propose an answer: that the mysterious voice is God’s (OK, not such a stretch), the still, small voice (I Kings 19:12) that will guide us as we move forward into the new year, and yet reminds us of the vulnerability that we emphasize on Rosh Hashanah and Yom Kippur. It is this vulnerability, after all, in which you may find the Divine spark that makes us at once profoundly human and yet Godly. And the origin of this vulnerability is to be found in Parashat Bereshit, which we read today. The fourth most-viewed TED Talk of all time (videos of short, inspirational lectures, usually by people who are not celebrities) features the “researcher-storyteller” Dr. Brené Brown, and is titled, “The Power of Vulnerability.” Has anybody here seen it? Dr. Brown is a professor in the social work school at the University of Houston. Some of her research has been devoted to recording and analyzing people’s stories of shame and vulnerability. Our essential goal is connection. The ability to feel connected is what gives us purpose and meaning in our lives. Shame is the fear of disconnection. People who have a strong sense of love and belonging feel that they are worthy of love and belonging, and the way to achieve this is to expose your vulnerability, to embrace it, to allow your true self to be seen. Dr. Brown’s point is that we as a society tend to misunderstand the importance of vulnerability. None of us is perfect; that we leave for God. But it is, in fact, our vulnerability that makes us strong; it is our vulnerability that makes us attractive to others, the willingness to pursue love, careers, parenting, and other types of human relationships despite our fears of failure and rejection. Henceforward, says God, human life will be difficult. Nothing will be provided for us; we must work hard to eat, to live, to love. And we will try and fail, try and fail again. We will try to plant wheat, and thorns and thistles will grow instead. We will reach out to others for love and be rejected. We will work hard at making senior partner, only to be passed over. This is, of course, from the second Creation story, the more human of the two, Gen. 2:4b ff. The first story (Gen. 1:1 – 2:4a) is about order: six days of God admiring God’s own perfect work, and then resting. Shabbat is today that aftertaste of perfection, a little hint of the Garden of Eden here in Pittsburgh and everywhere else for 25 hours every week. But the other six days are days of toil and suffering. And that is what makes us human. We are subject to the elements, to the economy, to the vagaries of human relationships, to political forces, and so on. We are vulnerable. But wait a minute. Didn’t God make us this way? Is not our tendency to feel shame also Divine? Of course it was not from the tree. Shame was also created by God in those first six days of ostensibly “perfect” Creation. So when Adam and Eve lose paradise, and are told that they are on their own, that fundamental vulnerability comes from God. It is Divine. It is the essential piece of humanity, the finishing flourish, if you will, of Creation. So what is the voice proclaiming at the end of the holiday season? Embrace that God-given vulnerability. That is what the Yamim Nora’im, the High Holidays, are all about: we are frail, we need help. And carry that sense of frailty into the rest of the year. Live with it, because it will make you more wholehearted. Dr. Brené Brown concludes her talk by pointing out that the way that we deal with our vulnerability is by trying to numb it through addictive behaviors. “We are the most in-debt, obese, addicted, and medicated adult cohort in US history,” she says. But the problem with this is that you cannot selectively numb particular emotions, and so we have also numbed our ability to experience joy, gratitude, and happiness, and this has led to a whole host of other social ills. We are increasingly isolated, increasingly certain and inflexible in our beliefs, increasingly willing to assign blame rather than accept who we are. She offers that what we need to be teaching our children is, it’s OK to be imperfect. It’s OK to be flawed and wired for struggle, but you are worthy of love and belonging. I would append to this the idea that God created us that way, way back in Bereshit / Genesis. During Sukkot, we “invite” key figures in Jewish folklore to come and sit with us in our sukkah, in a ceremony known as Ushpizin. We call on Abraham, Isaac, Jacob, Joseph, Moses, Aaron, David, Sarah, Rebecca, Leah, Rachel, Miriam, Deborah, and Ruth to honor us with their presence. But we often forget that these characters were human, and hence imperfect. Abraham twice identified his wife Sarah as his sister, because he was afraid of being killed. Sarah laughed when promised a son late in life. Moses was ashamed of what may have been a stutter. Aaron made the Molten Calf, for crying out loud! And David, the great King David, slept with his neighbor’s wife and then had her husband killed in battle, because he was ashamed. These were flawed people! But they lived with their vulnerabilities. They are on display for all to see in the stories of the Tanakh. And we too must embrace our own insecurities, and raise our children to accept their shortcomings. Nobody’s perfect, my friends. Qol mevasser, mevasser ve-omer. Remember the still, small voice, calling out from the New Year. The imperfection within us is Divine; now get out there and be proudly vulnerable. ** Yes, if you study the words of the piyyut / liturgical poem carefully, you will find that it speaks of “various prophetic descriptions of apocalyptic events in the end of days,” (Reuven Hammer, Or Hadash: A Commentary on Siddur Sim Shalom for Shabbat and Festivals, p. 211). But the repeated lines at the beginning and the end are incomplete, and we repeat them five times. *** Please note that while some Christian denominations point to this episode as the source of “original sin,” Judaism reads the first few chapters of Bereshit / Genesis differently. God did not create humans to be immortal, and the first humans were not perfect. In other words, the expulsion from the Garden was inevitable, like the classic arc of tragedy. Over the last year, the Forward newspaper ran a series of articles by Abigail Pogrebin about Jewish holidays entitled, “18 Holidays: One Wondering Jew.” Ms. Pogrebin committed to observing traditionally the full year of holidays, from Rosh Hashanah through Tish’ah Be’Av. Although she is Jewish, she had never done so, and she supplemented her observance by speaking with a number of rabbis and Jewish leaders and scholars of all sorts. It was a very thoughtful project, and a pleasure to read. I must confess that I read her attempts to get to the bottom of Jewish holiday observance with a certain smugness – after all, this is the life that I lead, and these are the thoughts that I had as I took upon myself later in life to be a traditionally-observant Jew. I’ve had these conversations with myself and others. I’ve struggled with the line between appreciating the holidays and feeling overwhelmed by them (particularly in the month of Tishrei, which is stacked with many festive days). Even though I grew up in an observant home, my awareness and observance of the halakhic details of these days is much higher than it was in childhood – we barely knew of the existence of Shavuot, for example, and Tish’ah Be’Av, as far as I knew, only happened at Jewish summer camp. Did this year of six fast days, thirteen yamim tovim / festival days, nine hol hamo’ed / intermediate non-yom-tov festival days, twelve or so minor-holiday days, forty-nine days of counting the Omer, eleven Rosh Hodesh / new month days, three weeks of summer grieving for the destruction of the Temple, and a whopping fifty Shabbatot improve her life? Did these observances grant her more awareness, make her feel more grateful? Yes, because the mindfulness it incited — an unexpected wakefulness — made me look harder at every priority, every relationship, time itself. No, because I still get restless in long services. Yes, because I now see the point of rituals I used to think were pointless. No, because I still don’t see the point of many rituals. In short, it was a mixed bag. Ms. Pogrebin expresses relief for having survived (! ), and states candidly for the record that she will never do it again. She also confesses that she was not able to fully carry out some Shabbat and Yom Tov principles – she did not succeed in turning off her phone, for example (something to which I very much look forward on holidays) – and in some cases used her journalistic distance to avoid immersing herself entirely in the experience of some holidays.But she also clearly states that there is significant value in our tradition, that some things which had never been clear were now sensible and rewarding. Why do we do all the things that we do? What is the value in performing these rituals and customs? Who has time for all these holidays? And, if I have successfully come up with the justification, the time, and the inclination to dig deeper into Jewish life, where do I start? These are questions that we must answer as a community. If we don’t, we have no future. Here is a brief story about tradition, which you may have heard before: Mrs. Goldberg is preparing a brisket for Rosh Hashanah. Her young daughter is watching, and she notices that before she puts it in the oven, she cuts off both ends of the brisket, what looks like perfectly good meat, and she throws them away. “Why do you do that, Ima?” asks young Hannale. As Abigail Pogrebin states, most of us do not observe the holidays the way that she did over the past year. And most of us do not know why we do what we do. But many of us grew up in homes in which certain things were done, but we were not sure why. But we did them because, well, that’s just the way we do things. We like preserving things. There is a general principle in rabbinic Judaism: Minhag avoteinu beyadeinu. Our ancestors’ customs are in our hands. But times, as we know, have changed. Nothing may be taken for granted any more. The transmission of the brisket recipe, let alone many more essential Jewish rituals, have been left behind. The cycle of expecting our children to make the same choices that we have has broken down in the ocean of infinite choice set before each of us. At the last United Synagogue convention, two years ago, Rabbi Ed Feinstein described America as “choice on steroids.” Given that, we will have to rebuild our notions of what it means to be Jewish. Something intensifies. Like when my eye doctor gives me option “1 or 2” when he sets my eyeglass prescription, I suddenly saw option 2. The Jewish schedule heightened the stakes somehow -— reminding me repeatedly how precarious life is; how impatient our tradition is with complacency; how obligated we are to aid those with less; how lucky we are to have so much food, so much history, so much family. I was honestly, maybe saccharinely, moved by mundanity itself — and its simplest joys — more than ever before. The small stuff got sweeter — in my normal, non-religious life: The way my daughter and son talk to each other when they don’t know I can hear them. The way something tastes after a fast. The sight of a delivery guy loaded with bags on his bicycle. My baby sitter’s loss of her brother in Trinidad. The ease of having my college friends at one table. I marked more. Paid attention. Lingered longer. And yet, her conclusions suggest that the bar is too high. She sees the value in following the cycle of holidays, and yet she is unable to fulfill all the expectations. She is open to it, but still will not jump in. If not her, then who? Sukkot, of all holidays, suggests these things the most. On these days, we invite others into our tents; it is about celebration tinged with the lingering sense of repentance and forgiveness. It is about looking back over the holiday cycle and forward into the coming year. Openness. Wistfulness. Frailty. Joy. We have to open more doors, so that more Jews will enter, so that more will find the same benefits that Abigail Pogrebin discovered: the heightened joys, the greater appreciation, the increased awareness of the need to see beyond one’s own nose. There is a real, tangible value to being invested in Jewish life. There were a lot of people here on the first two days of Sukkot. Many of us in this community understand Sukkot; we understand how the holidays frame our lives with joy and gratitude, love and appreciation, structure and comfort in difficult times and so forth. We know and appreciate the spiral of our lives as we move upward in time, bolstered by the holy moments of the Jewish year as they come around for each successive mahzor, cycle. And yet, most of American Jewry does not know very much Hebrew; most of us do not keep kashrut / the dietary boundaries; most of us do not keep Shabbat or festivals in any traditional way; most of us are not marrying fellow Jews. These are realities of today’s Jewish world. How are all of those non-engaged Jews ever going to drink from the wells of Jewish tradition, to appreciate its value? We cannot pretend that people who are not committed to living a halakhic lifestyle are simply going to show up at 7:30 on Wednesday morning and start davening Pesuqei Dezimrah. We have to invite them in through other doors. We have to start small. If we want to widen our circle, if we want more people to join us, we have to lead them to an entry point and encourage them to stick at least a toe in. Otherwise, we’re merely cutting the ends off of the brisket for no apparent reason. We’ll be talking more about this as the year goes on, in various forums. But meanwhile, for those of us who are here, who have those happy holiday memories, who have those strong bonds with Judaism and Jewish life that keep pulling us in, let’s continue to revel in the power of the holiday cycle. Let’s continue to let those holy moments change us, to inspire us to learn and re-evaluate, and to draw on that inspiration to welcome others in. We have to create memories for others, and create relationships with those who are not here. We need these days. The Jewish world needs these days. Open up those doors. Mo’adim lesimhah, haggim uzmanim lesasson! In a radio interview about his talk with Castro, Goldberg assured listeners that if Castro were doing a standup routine for a Marxist audience, that would be simply hysterical. Frankly, I’m not sure that I get it, as I must admit that I am not up on my communist jargon. However, the story reminded me of something that I always used to tell the students in my Bar/Bat Mitzvah Workshop (back in Great Neck) when we arrived to the unit on theology: what you believe now may not apply next year, or in ten years, or in 50. Our understanding of God, our interaction with the Divine changes as we change. So you always have to stay open to new ideas, new evidence, and new theological approaches. An ideologue like Castro may never depart his atheistic moorings. But those of us who occasionally step into a house of worship, however we feel about it, will surely develop in our relationship with the Qadosh Barukh Hu. And that development can go many different directions, as long as we remain open. That brings me to Sukkot. The primary goal of this festival, I am sure, is to challenge our theology, to make us revisit our understanding of and relationship with God, and I am going to give you four pieces of evidence to support this claim, four themes of Sukkot: Joy, service to God, the well, and the rituals of Sukkot. 1. Joy. Simhah. It is the most joyous festival of the year (Deut. 16:15: Vehayita akh sameah – you shall be overwhelmingly joyful), and the only one that will be celebrated after the mashiah comes, at least according to one tradition. It is at times of great emotion that we are most open to theology, and look for deeper meanings. The cold, rational exterior of the everyday routine keeps us focused on the business of going about life: work, family, shopping, paying bills, and so forth. During these times, God seldom penetrates our consciousness. But at times of great joy, like holidays, weddings, benei mitzvah, beritot milah, and so forth, when family gathers to celebrate, we are likely to reflect on what we are thankful for, and the source of good things. Likewise, at sad times, surrounding illness, death, or other types of loss, we tend to look to God or tradition for answers. As such, Sukkot seems like a perfect time for spiritual reflection – gratitude for what we have, anticipation for the future, relief for having sought teshuvah / repentance on Yom Kippur. 2. Service to God. This was the time of the heaviest sacrifice schedule in the Temple. Far more than any other holiday, there were a total of 98 lambs and 70 bulls offered on the altar over the course of the seven days of the festival. All of this sacrifice was surely thanksgiving for the harvest, the most joyous time of the year in any agrarian society. But it also suggests that the spiritual pathways to God are especially open on this festival, that God is most receptive to us, and we to God. As Jews, we sanctify time; I mentioned this on Yom Kippur. The spiritual pathways that were open to our ancestors at this time must still be available, because even though we do not sacrifice animals like they did, we still sanctify this festival with prayer and rituals and joyous celebration. This is a week of abundant holiness. 3. The well. At the end of the first day of Sukkot, the biggest party of the Israelite year was thrown. It was called Simhat Beit Hashoevah, the celebration of drawing water from a certain well in Jerusalem, and is identified the Mishnah, Tractate Sukkah, where it says (5:1) that anybody who has not witnessed this ceremony has never seen true simhah, true rejoicing in his whole life. This custom is long gone, of course, perhaps because we do not know where that well is, or what the purpose of the ceremony was. But learning about it conjures up some kind of magical, mystical image of unabandoned celebration of a holy, essential act. There are synagogues and other Jewish communities who have revived a form of this party today, generally by hosting musical events. When I was in rabbinical school at JTS, I had a philosophy class on the newer modes of spirituality, and how they differ from the traditional Western concept of “religion.” We discussed two major types of seekers today, the mountain climbers and the well-diggers. Mountain climbers look outside for spiritual nourishment; they climb up to see what they can see. Well-diggers look inside; they mine themselves for enlightenment. In our canon, Moshe was a mountain-climber; Avraham was a well-digger. 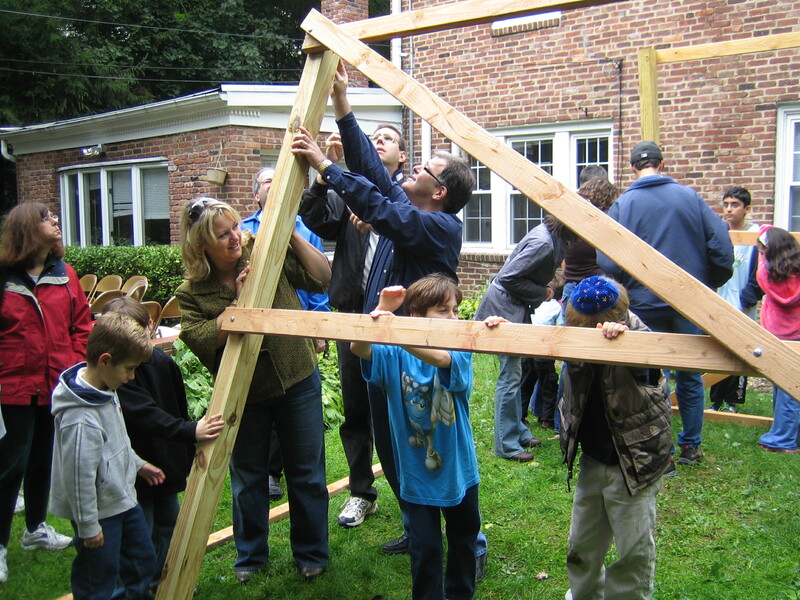 If Shavuot is the festival of mountain climbers, then Sukkot is the holiday for well-diggers. Perhaps the celebration of the well suggests something particularly deep (ha ha!) about the nature of this festival. At the same time that we receive great pleasure from the harvest, which is about material success, we are also celebrating having emerged from Yom Kippur cleansed of sin and rejuvenated, and we therefore must remember to also mine our own personal depths for the non-material elements of God’s favor. The well ceremony is thus a kind of metaphor for our own internal wrangling with God. 4. Rituals. Sukkot today is laden with curious rituals, some of which seem to be drawn from non-Israelite customs – waving four species around, living in temporary dwellings, beating willow branches against the ground, parading around asking to be saved. You shall live in sukkot (temporary structures) seven days; all citizens in Israel shall live in sukkot, in order that future generations may know that I made the Israelite people live in sukkot when I brought them out of the land of Egypt. The commentators suggest that it is incumbent upon all of us to live in the Sukkah as much as possible, and that the Torah specifies “citizens” to make clear that it is for rich and poor alike, that nobody should feel like doing so is beneath them. We “live” in the Sukkah to bring us back to the wilderness for just a moment. And, as we all know, the wilderness is the place for visions of God: the burning bush, receiving the Torah on Mt. Sinai, Jacob’s angelic dreams, Ezekiel’s chariot and valley of dry bones, and so on. 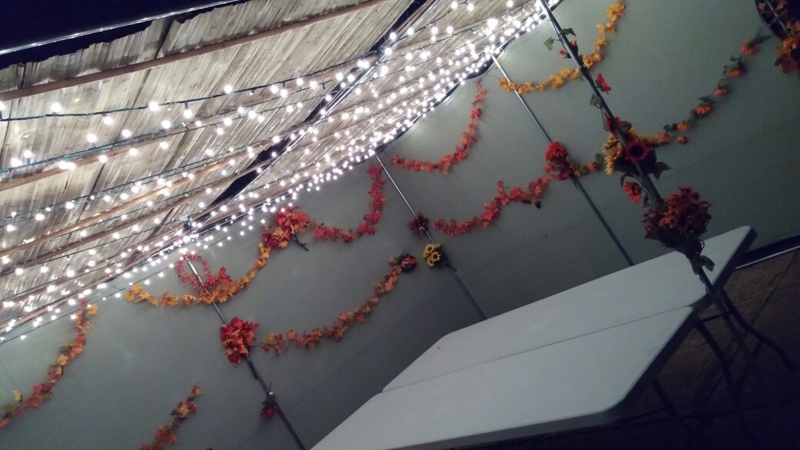 The Sukkah is a place to be open to communication from God. The commentator Rashbam says that this is precisely the time of the year, when the harvest has been gathered and we’re feeling flush, that we should vacate our homes and property to live in a simple hut. Even though most of us are not farmers, the sukkah still reminds us that it is not through our own hands that we have obtained all of our material goods. I have a colleague who posted a story on Ravnet (the email list for Conservative rabbis) about how he was approached after services on Rosh Hashanah by a congregant who told him that the services were not “spiritual.” The rabbi fretted over this for a while, as I would do, and then discussed the matter with his wife, as I would also do. The rabbi’s wife said, in essence, relax. There are no spiritual services, only spiritual people. A true partnership in congregational Judaism is when the clergy opens the door, and the laity walks through. We can only meet you halfway; you must seek God as well. Eat there with your family and friends, or alone – and take a moment to think about the blessing of food and nourishment. Perhaps discuss what it took for the food to reach your table. Read in the sukkah. Take your favorite anthology of poetry or a book of Jewish short stories or a siddur. Meditate on the themes of joy, service to God, and the spiritual well. In this season of heightened spiritual energy you might get lucky and discover an open well that you had not noticed before.